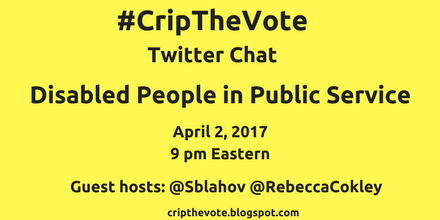 Image description: graphic with a bright yellow background with black text that reads "#CripTheVote Twitter Chat Disabled People and Public Service, April 02, 2017, 9 pm Eastern, Guest hosts: @sblahov @RebeccaCokley, cripthevote.blogspot.com"
Since #CripTheVote began more than a year ago our discussions have repeatedly come back to the need for disabled people in public service. The co-partners of #CripTheVote, Andrew Pulrang, Gregg Beratan, and Alice Wong, and guest hosts Rebecca Cokley and Sarah Blahovec will discuss the many of the issues surrounding disabled people and public service. Blahovec, Sarah. (February 1, 2017). Someone Should Help Disabled People Run for Office. NOS Magazine. LaCorte, Rachel. (January 7, 2017). Washington Set to Swear in 1st Blind Lieutenant Governor. Associated Press. Wade, Carrie. (January 23, 2017). 10 More Disabled Women Who Are Making Political Noise. Auto straddle. Wong, Alice. (October 17, 2016). #CripTheVote Interview: Thida Cornes for Mountain View City Council. 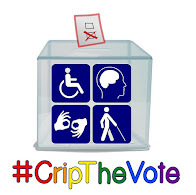 Welcome to the #CripTheVote chat on disabled people in public service! Let’s do this! This concludes the #CripTheVote chat on disabled people in public service. Many thanks to our guest hosts @RebeccaCokley & @Sblahov!! We have decided to reschedule this chat for a couple of days earlier, to give people a little more time to take post-chat action before the next major step in this process, a House of Representatives vote on Thursday. 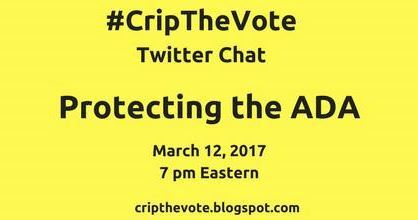 The co-partners of #CripTheVote, Gregg Beratan, Andrew Pulrang, and Alice Wong, invite you to the 17th Twitter chat focusing on the proposed Republican Health Care bill, The American Health Care Act (AHCA). What should you know about this bill? How will it impact people with disabilities? What can you do express your views? We are thrilled to have guest hosts Bruce Darling of the Center for Disability Rights and Julia Bascom of the Autistic Self Advocacy Network join and share the latest information with us. Rebecca Vallas, Katherine Gallagher Robbins, and Jackie Odum, March 8, 2017, Center for American Progress. Disability Rights Education Defense Fund, March 15, 2017. Storify of our October 9, 2016 chat on health care policy. Follow @GreggBeratan @AndrewPulrang @DisVisibility @ADAPTerBruce @JustStimming on Twitter. If you might be overwhelmed by the volume of tweets and only want to see the chat’s questions so you can respond to them, check @DisVisibility’s account. Each question will be tweeted 5-6 minutes apart. 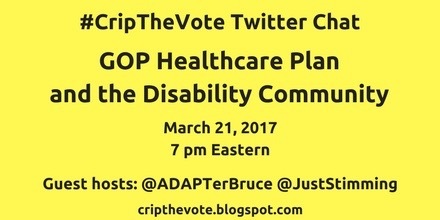 Welcome to the #CripTheVote chat on the #AHCA w/ guest hosts @ADAPTerBruce @JustStimming. Please remember to use the hashtag when you tweet. Stories are powerful ways to illustrate the relationship between the individual, policies, and practices. They give examples of real-life consequences to changes in programs such as Medicaid, Medicare, and Social Security. The personal IS political. The co-partners of #CripTheVote invite you to share your Medicaid Stories. Your stories will be featured in blog posts and other social media content as part of our our activism to save and defend Medicaid. Share your #MedicaidStories by clicking here on this link. Also, please join us for our 3/21 Twitter chat at 7 pm ET: GOP Healthcare Plan and The Disability Community, with guest hosts Bruce Darling and Julia Bascom. 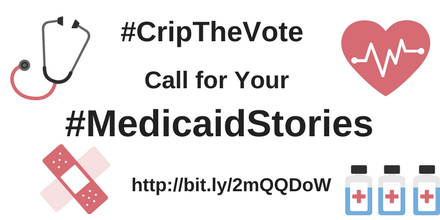 [Header image description: graphic with white background and black text that reads: "#CripTheVote Call for Your #MedicaidStories http://bit.ly2mQQDoW. On the upper left-corner of the image is a graphic of a stethoscope in gray, pink, and black. On the upper right-corner of the image is a graphic of a pink heart with a heart beat sign across it. On the lower-left corner of the image is a graphic of two band-aids crossed like an X in pink and dark pink. On the lower right-corner are graphics of 3 identical prescription bottles in gray, blue, and black with a pink plus sign in the center of each]. In the immortal words of Ferris Bueller, “Life moves pretty fast.” This is particularly true with the current administration and changes in policies and programs that seem to happen on a daily basis. Join the co-partners of #CripTheVote, Gregg Beratan, Andrew Pulrang, and Alice Wong, in a conversation on the importance of protecting the Americans with Disabilities Act, and the proposed changes to this law that may impact people with disabilities. Follow @GreggBeratan @AndrewPulrang @DisVisibility on Twitter. 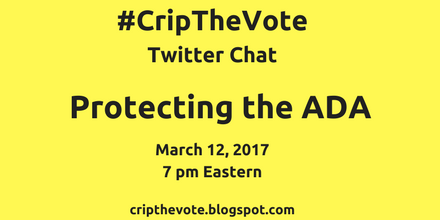 Welcome to the #CripTheVote chat on protecting the #ADA! Please remember to use the hashtag when you tweet. It looks like an "ADA notification bill" has been re-introduced in Congress, and the risk of it passing is probably greater now than ever before. We have decided to postpone our March 12th chat on "Disabled People in Public Service," and instead host a discussion on "Defending the ADA." The date and time will be the same ... Sunday, March 12, at 7 PM Eastern, but the topic will be different. The public service chat will be held at some later date. House of Representatives bill H.R. 620: ADA Education and Reform Act of 2017, (click the link to see details of the bill), would require a waiting period and documented efforts at resolution for Americans with Disabilities Act complaints before private lawsuits could be filed. If you experienced an ADA violation, you would not be able to sue until you first contacted the business owner to try and resolve the problem, and waited a certain amount of time to let them fix the problem, before being allowed to sue. The most often cited reason for this is instances of disabled individuals and their lawyers filing dozens of ADA lawsuits against businesses, supposedly completely by surprise, and supposedly to make money off out of court settlements. That's the story anyway. Obviously, there's another side or two to this narrative, and in the next few days we will post some questions that will structure our chat. Stay tuned, but in the meantime, change your calendars accordingly!